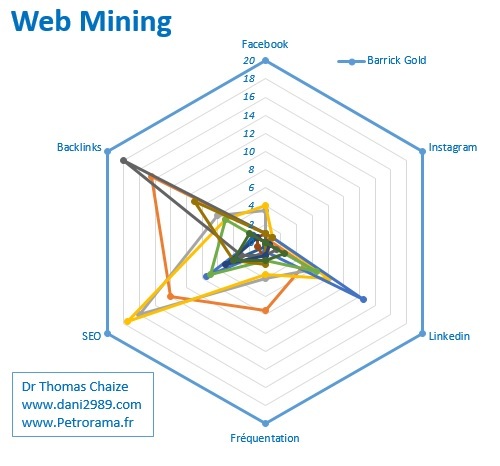 Barrick Gold and Digital Strategy. Barrick Gold is the world's largest producer of gold with a production of 5.5 million ounces of gold in 2016, at an average cost of $ 730 per ounce (All-in sustaining costs). Barrick has 25 billion assets and 15 billion debt (this is not a buy or sell advice). For once my tools are not those of the fundamental analysis (the figures) or the technical analysis (the graphics), but of the web manager. The social network Facebook which is impossible to circumvent. Linkedin professional network to measure the network of relationship. The social network of photography Instagram. Of course it is very far from the subject, but the idea here is to measure the "one does not give up anything". The nerve of the war: the attendance of their website (the number of visitors month). The number of keywords referenced by Google on their website. Backlins (links that are directed to their site). After a period of hesitation I left aside the rate of rebounds (bounce rate). That is, the measure of people who stay or leave the website (Barrick Gold was still ahead). The method to get the beautiful graphic below is simple I took the numbers from the first of each category to which I gave a score of 20. The other companies were then scored proportionally to their performance. The chart includes the top 12 gold producers in the world. I kept only the first for these few lines. Please note that the numbers used are likely to contain errors, which is important for the overall picture. III. And the Winner is "Barrick Gold". Barrick Gold is far ahead in the six headings. I think if I had used 20 measurement tools the situation would have been the same. Barrick gold's ultra dominant position is not the result of chance. The firm of Peter Munck has built his presence on the Internet from a coherent and, above all, systematic strategy. Of course not ! I know of gold or silver mines that were totally "virtual" during the rushes of 2003 and 2006. Some were able to raise hundreds of millions of dollars of capital solely on the quality of their internet communication. Then, thanks to these assets, they became real producers. It is vital for Barrick Gold to also be # 1 on the internet to have maximum visibility with potential investors (this is even more important at the bottom of the cycle). If you have any questions, remarks I am available. And if you want an external opinion on the web strategies of your sector, your competitors or your company contact me.